AquaBells Ankle Weights from HealthyKin.com allow you to maintain your lower body workout regimen while on the road! These fully collapsible Ankle Weights, unfilled weigh less than 8 ounces, and are small enough to fit into a fanny pack. Filled with water they provide up to 8 lbs. of resistance per pair. Simply fill to the 2 ankle weights to your desired weight and attach with the comfortable Velcro straps. Great for physical therapy, and also can be used for water resistance programs when in swimming pools, too! Includes Two Ankle Weights, adjustable up to 8 lbs. Just fill with water to the desired weight. 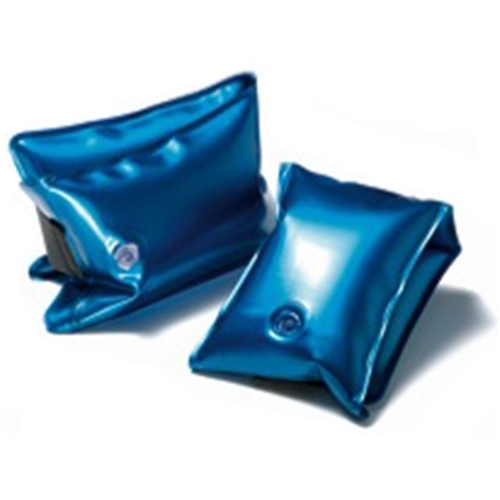 Deflates in seconds, when traveling it is compact enough to fit into a fanny pac. Soft cushioned vinyl that conforms to your ankles for comfort. The set weighs only 8 oz. when collapsed. Men and Women can stay fit with this water inflatable workout system while traveling, at home or in the office. Designed specifically for people on the go. A very portable workout system for strength training and great for physical therapy. Workout in the convenience of your hotel room, home, or office. You can take your weight training with you wherever you go, without lugging 8 lbs. of heavy ankle weights in your travel bag or car. Made of soft vinyl and Velcro straps, which is gentle on the skin. while you travel without overweight luggage.